Topic-linked pairs of engaging character stories and compelling non-fiction books at Levels 1 to 9. Perfect for deepening comprehension and encouraging children to enjoy both fiction and non-fiction. This pack contains 360 books, six copies of each book at Levels 1 to 9, and the series Handbooks. Topic-linked pairs of imaginative character stories featuring well-loved characters and compelling non-fiction books. The books in each pair are linked to each other, so that children reading the fiction will be motivated to read the matching non-fiction afterwards, and vice-versa. All pairs focus on a science, geography, history or art topic, so that they support the wider curriculum and link in with subjects being taught in the classroom. 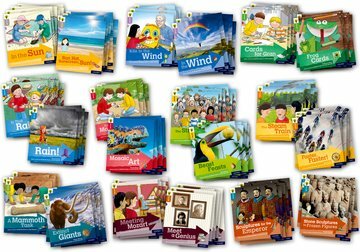 The series develops the comprehension skills children need to reach the expectations of the 2014 National Curriculum, with comprehension questions included in every book. Engaging phonically decodable text is appropriate for developing readers, featuring a limited number of high-interest topic words to enrich and add interest and support vocabulary development. Wordless books at Level 1 provide captivating books for children who have not yet learned to decode. They provide lots of opportunities for discussion and playing with environmental sounds to help prepare them for their first steps as readers. Fiction books feature all the characters from the Biff, Chip and Kipper stories. Real-life scenarios and humorous illustrations as well as dramatic magic key adventures inspire and motivate the reader. Non-fiction books feature stunning photographs and the varied texts engage readers with new and wide-ranging information. All books are accompanied by teaching notes and handbooks, which focus on developing comprehension alongside developing decoding skills, and inside cover notes, which provide targeted support for parents and teaching assistants. The series is underpinned by Oxford Levels and the Oxford Reading Criterion Scale, matching every child with the right book through careful grading.